Burnt Offerings is pretty much the perfect horror movie. Psychological, mysterious, and haunting, it breaks away from many of the more gruesome exploitation films of the early 1970s while being very much distant from the American slashers that were to follow. 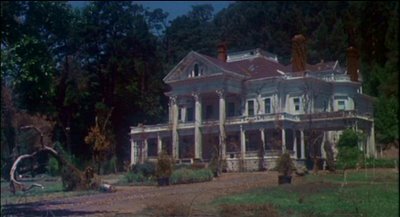 Featuring an all-star cast of Karen Black, Oliver Reed, Burgess Meredith, and Bette Davis, Burnt Offerings offers a truly original take on the haunted house. Rather than the home being an area that the dead occupy, as we’re accustomed to seeing in haunted house films, the home here is very much alive…and it needs to be fed. Fairly faithful to Robert Marasco’s brilliantly vivid 1973 novel of the same name, Dan Curtis’ (also director of Trilogy of Terror) version of Burnt Offerings retains that fuzzy, hazy, confused and uncomfortable sensation that pulsates throughout the narrative of the book. Epitomizing the phrase “if it’s too good to be true, then it probably is,” the film centers around the Rolf family (Ben, Marian, and Davey) who have rented a gothic country house for the summer as a means to escape their hectic life in the city. The strange owners of the house, the Allardyce siblings Arnold (Burgess Meredith in a wonderful flamboyant performance as the wheelchair bound “brother”) and Roz (an in-control and raspy voiced “sister” Eileen Heckart), should have been the young family’s first warning. The ridiculously low rental price for the summer announcement following by the catch that the Rolfs would have to take care of the Allardyce “mother” during their stay should have been their second. But the lure of the house is too strong for Marian and so she enters her family into ruin. Immediately Marian becomes obsessed with the house. She cleans, straightens, swoons over its interior as the life begins to drain out of her. She spends increasingly more time in the never-present Mrs. Allardyce’s room, becoming one with it. Her hair becomes gray, clothing becomes Victorian. And she’s not the only one who changes. Aunt Elizabeth, a spry swearing-smoking-cursing 74 year old (played by the powerhouse Bette Davis) literally begins to crumble before our very eyes while young blood Davey becomes the main target and Ben (the manly Oliver Reed) descends into violent madness. Ben’s hallucinations include one of the more unforgetable images in horror film: the thin, grinning chauffeur. He is the source of Ben’s nightmares (presumably stemming from the funeral of his parents at a young age) and, subsequently, the source of nightmares for numerous viewers since Burnt Offerings’ release. Architecture, domesticity, and women are the narrative backbone of haunted house stories. From The Castle of Otranto on up to Psycho, the role of the woman and her downfall are often told through the relationship to the home. 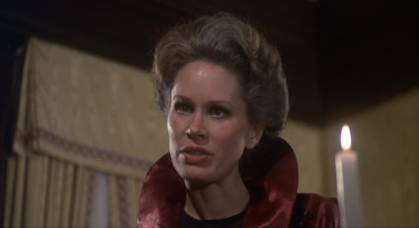 So, while Reed’s “Ben” is the character with whom the audience identifies with on this horrifying journey (he trys desperately to save his family even when in a near catatonic state), it’s Karen Black’s “Marian” is the one whom the story centers around. Marian – her body, soul, and mind – become absorbed into the Allardyce house and, through the deaths of her family, experiences a re-birth which places her as the new motherly soul, the beating heart if you will, of the home. One could very much view Burnt Offerings as commentary on the second wave of feminism, much like The Stepford Wives, because it firmly and forcefully re-places the woman back into her proper place as “mother” and caretaker. In a role that could easily be over-the-top, Black plays Marian with a quiet subtlety that has to be one of the best performances in horror film. Black establishes her obsession with the house so steadily and convincingly that when she returns back into the house, we don’t yell at her to not go up the stairs as we do in other horror films. Instead, we sympathize with her compulsion recognizing, as she has throughout the film, that what is about to happen to her is inevitable. Because we know, through Black’s depiction Marian, that the Rolf family structure has to be obliterated to preserve the Allardyce family. This can only happen through the rejuvenation of the home and this home is vampiric, sucking the blood from its victims in order to become new again, everlasting, to remain part of a mysterious other-worldly cycle. Fantastic review of ‘Burnt Offerings’. I’ve never seen it explained better.